The Lady in Gold, considered an unforgettable masterpiece, one of the twentieth century's most recognizable paintings, made headlines all over the world when Ronald Lauder bought it for $135 million a century after Klimt, the most famous Austrian painter of his time, completed the society portrait. 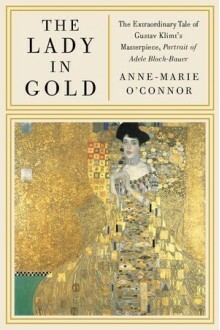 Anne-Marie O'Connor, writer for the Washington Post, formerly of the Los Angeles Times, tells the galvanizing story of the Lady in Gold, Adele Bloch-Bauer, a dazzling Viennese Jewish society figure; daughter of the head of one of the largest banks in the Hapsburg Empire, head of the Oriental Railway, whose Orient Express went from Berlin to Constantinople; wife of Ferdinand Bauer, sugar-beet baron. The Bloch-Bauers were art patrons, and Adele herself was considered a rebel of fin de siècle Vienna (she wanted to be educated, a notion considered "degenerate” in a society that believed women being out in the world went against their feminine "nature"). The author describes how Adele inspired the portrait and how Klimt made more than a hundred sketches of her-simple pencil drawings on thin manila paper. And O'Connor writes of Klimt himself, son of a failed gold engraver, shunned by arts bureaucrats, called an artistic heretic in his time, a genius in ours. She writes of the Nazis confiscating the portrait of Adele from the Bloch-Bauers' grand palais; of the Austrian government putting the painting on display, stripping Adele's Jewish surname from it so that no clues to her identity (nor any hint of her Jewish origins) would be revealed. Nazi officials called the painting, "The Lady in Gold" and proudly exhibited it in Vienna's Baroque Belvedere Palace, consecrated in the 1930s as a Nazi institution. The author writes of the painting, inspired by the Byzantine mosaics Klimt had studied in Italy, with their exotic symbols and swirls, the subject an idol in a golden shrine. We see how, sixty years after it was stolen by the Nazis, the Portrait of Adele Bloch-Bauer became the subject of a decade-long litigation between the Austrian government and the Bloch-Bauer heirs, how and why the U.S. Supreme Court became involved in the case, and how the Court's decision had profound ramifications in the art world. In this book listeners will find riveting social history; an illuminating and haunting look at turn-of-the-century Vienna; a brilliant portrait of the evolution of a painter; a masterfully told tale of suspense. And at the heart of it, The Lady in Gold-the shimmering painting, and its equally irresistible subject, the fate of each forever intertwined.